Explore the city’s most macabre destinations! Enjoying colorful historical and ghost stories! Use actual paranormal investigation equipment to try and make contact! 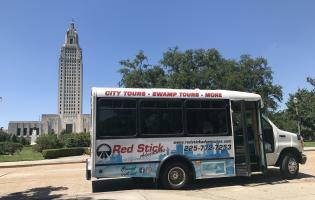 Experience first-hand the legends and ghosts of Baton Rouge. Listen to the tales as you ride and walk the historic areas as the time-traveling guide leads you to some of the most reputed haunts in town. Join in a ghost hunt at documented haunted sites with actual paranormal investigation equipment.